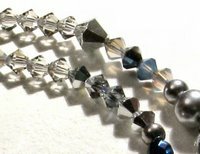 I made another necklace today. The idea for it came from the Japanese Star festival, celebrated around July 7th and derived from the Chinese festival called Qi Xi - or "the night of sevens". 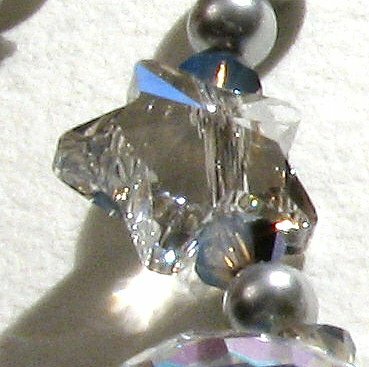 The idea of a Tanabata necklace came from a lovely Swarovski teardrop faceted bead I had. 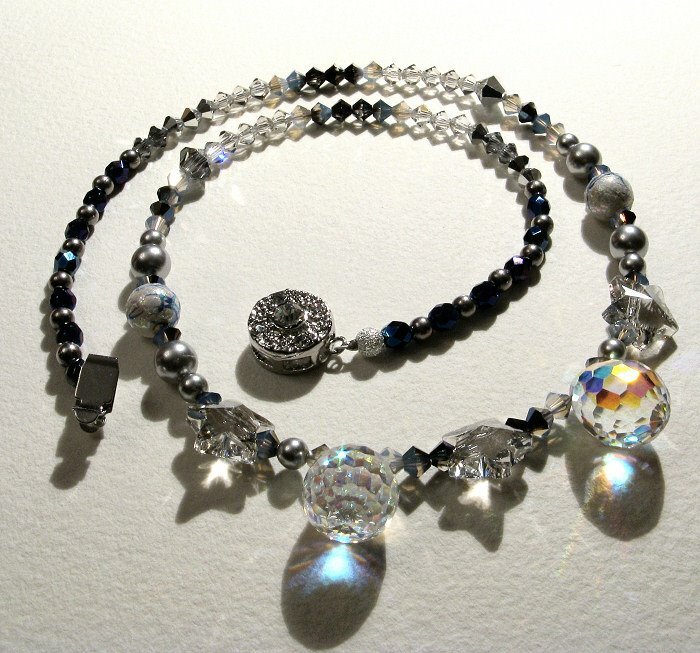 Unfortunately, I only had one, then I had to wait to buy the 2nd bead, just like the legend behind the festival, which celebrates the meeting of two celestial lovers, Orihime and Hikoboshi, namely the stars Vega and Altair, respectively. 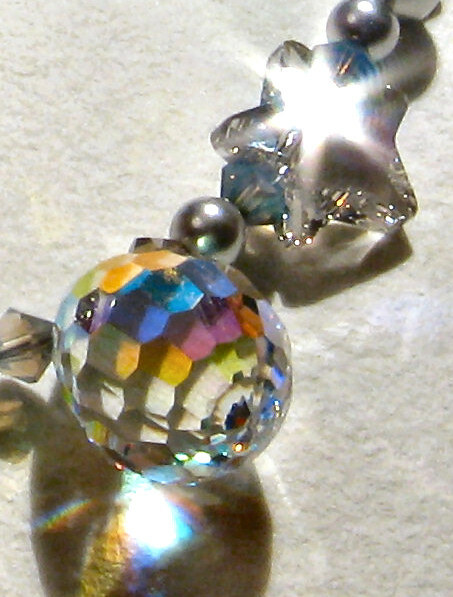 These star-doomed lovers are allowed to meet only on the 7th evening of the 7th month, which very roughly would correspond to the 7th of July, always bearing in mind the date varies due to the Japanese calendar being lunisolar. 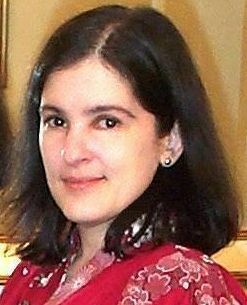 So, it may happen some time between July and August of our Gregorian calendar. Tanabata is a time for encounters, and wishes and vows to be written and hung onto bamboo plants or set afloat in the river, and even burnt on festive fires the night of the festival or the day after. It's lights, and that's why I have selected only Swarovski crystals that somehow resemble a night, starry sky on Summer time. - One silver-plated Swarovski clasp with embedded strass flatbacks. Above, details of the two Swarovski focal beads 6002, representing Orihime and Hikoboshi, with a lovely faceted cut with AB coating. 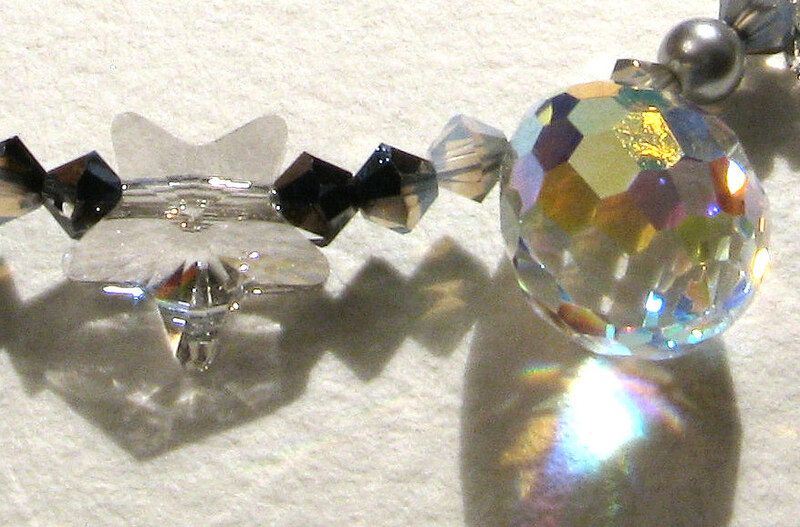 Some of the bicones, pearls and Swarovski stars can also be seen. 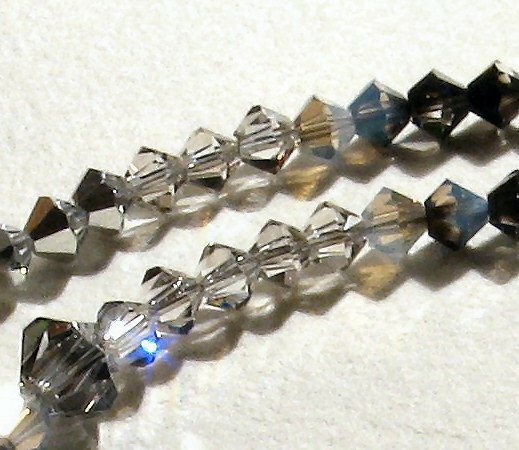 The 6002 beads are only 15mm long, thus quite small. 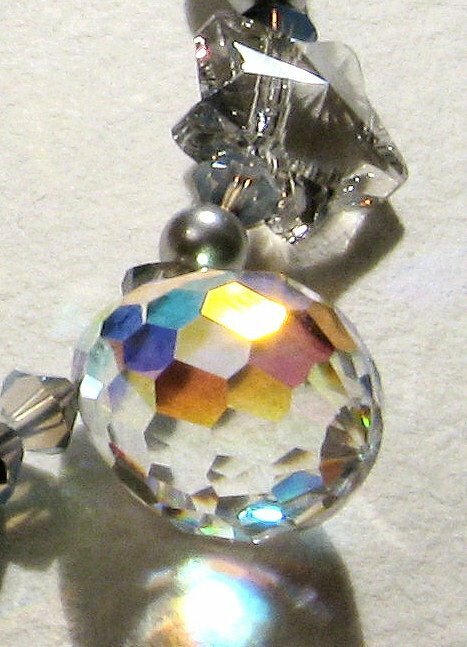 The necklace as a result is very delicate and short, and no gemstones were used this time. 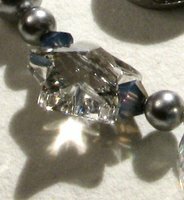 Some details of the Swarovski crystal silver shade stars, and also the bicones and pearls. 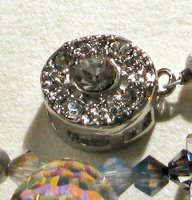 A detail of the Swarovski clasp with embedded rhinestones and more of the 6002 beads, with their wonderful AB effect and impeccable cut. 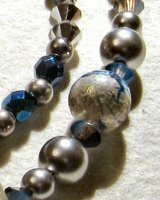 On the 1st picture a detail of one of the vintage Japanese faux pearls in shades of white with blue veins, as well as the Swarovski pearls, some bicones and those small faceted Czech Fire beads. The remaining pictures show close-ups of the bicones in two different sizes and diverse shades of blue, silver and white. 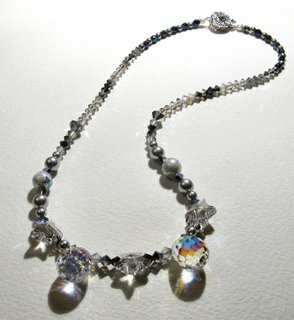 I tried to emulate a fading effect with the colours here, that is why I had to use 4 or 5 different shades and effects. I just found your blog a few minutes ago and am in love with your Tanabata necklace. I am sitting here with my beads and wire looking for inspiration to create a pair of earrings. 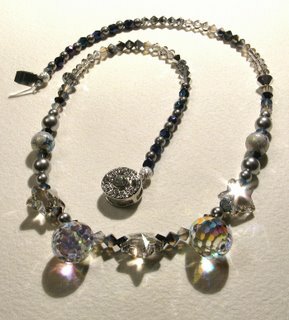 I want to create something that reminds me of the universe and your necklace certainly does! All of the beads you used reminds me of the planets and stars. Just gorgeous. 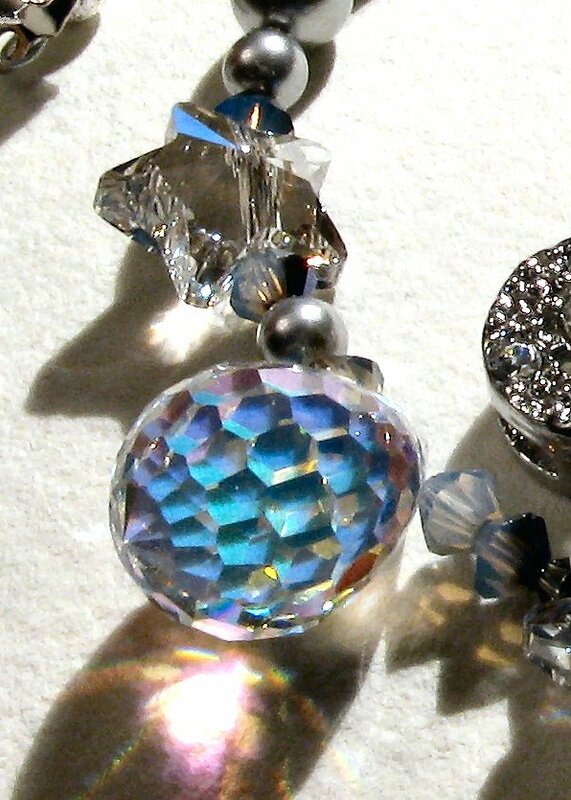 Do you make these to sell because I would love to own one.